Discussion in 'Semi' started by domenick, Mar 7, 2018. 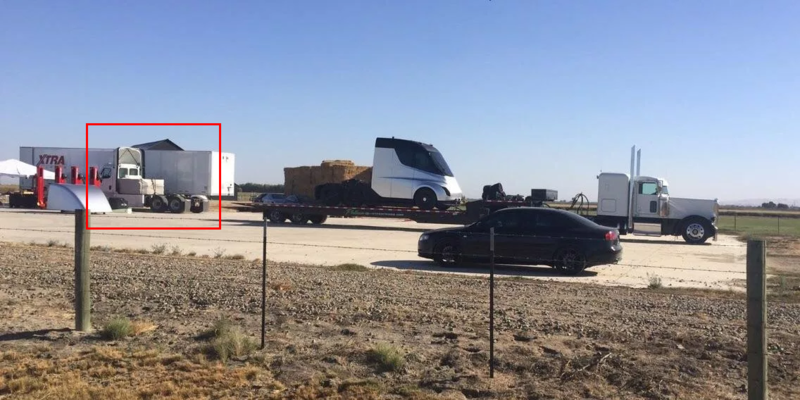 Elon Musk just sent out a shot on Instagram of a pair of Tesla Semis ready to hit the road, from the Gigafactory to the Fremont factory. Yeah, I was wondering if there are super fans nearby up for an impromptu road trip. I am sure the shorts are following it and recording in the hope to catch some issue - imaginary or made up - so that they can blow it up. So if you don't see any video, then it was another boring drive. You know, some of those shorts (and probably an "unbiased" auto journalist or two), are so desperate for unflattering Tesla stories, I would not be surprised if they hired people to follow the trucks on their behalf. As a writer myself, I would love to be following them, though. Even trouble free, it's a pretty great story. Even trouble free, it's a pretty great story. This would be akin to the first diesel or electric locomotive, when steam engines were king. Anyone seen them arrive at Fremont today? Not first cargo trip. First PRODUCTION cargo trip. There is no way that truck hasn't been on the road for quite awhile already. Every vehicle Tesla has ever produced ran on the roads in a mule. Tesla has a significant advantage here, as the trip from Nevada to Fremont has a lot of downhill. That is when the trucks are loaded to the max with heavy battery packs and motors. Going back up the hill they should have a much lighter load. There is a huge electric dump truck that goes up the mountain when empty, but comes down full when full of mining product. It generates enough juice coming down that it does not have to be recharged on the way back up. It is a closed loop regeneration cycle. Also does not need to ride it's brakes all the way down. With some creative thinking, battery transportation has all sorts of clever applications. Cool. This works only because it has a load that it carries down the slope, that it does not have to carry back up the slope. The mass/payload that is carried down generates additional energy that compensates for any electrical and frictional losses. An equally laden truck on both directions would need some charging. Not necessarily. Elon and Tesla do things by the seats of their pants frequently. While people have seen the semi around town, it hadn’t been sighted (afaik) pulling a load. This could indeed be the first or one of the very first true long distance load tests. I mean, why not load up the trailer with a useful load when doing your first long distance load test? They've never released a new vehicle 'by the seat of their pants'. There has always been a mule out testing. Why would Elon qualify his statement by stating it was the first production? Do you really believe that the first long distance load test would be with a recognizable cab? If the test failed, the press would be all over that. If there wasn't a mule out testing, why did major trucking companies place orders right at the reveal? For the kind of money those guys were spending, they would have needed data. Evidence. Of course that testing has been done, probably have been running tests for many months. It would make sense for them to have been running batteries between the Gigafactory and Fremont in a mule. They needed those batteries transported. They needed to test the semi. It's 262 miles, does the semi need to recharge or can it make it on a single charge? It should easily be able to make it on a single charge. (Even the lower range version.) Part of that is because it is mostly downhill, and they probably don't have a full 80k pound load. I interpret this as first cargo trip carrying production goods in prototype trucks. The 4000 vertical foot net drop heading west will certainly help but if the 500 mile spec is true then it should be ok both directions. The parsing on reddit was that it is the first "production cargo" because it is starting a regular route bringing packs for the Model 3 (parts needed for production). Not just a test route, but the Semi is still a pre production unit (alpha, beta, production candidate, whatever label it deserves). When they had the final candidates for the model 3 they clearly labeled them as such and discussed them in multiple meetings and presentations before the design went into production even though the design was finalized months before production started. If the design was finalized I'd expect a tweet, press release, video, or website update to note the date the design was finalized like they did for Model 3. But whatever label is on it, I have no doubt this thing is ready to use. They were probably waiting for Model 3 to ramp up to focus more on the semi, but at some point got to the point where they had no reason not to use it for Sparks to Fremont hauls. 1) Did they make it with no issues? 2) Did they have to charge at all (guess that depends on the batteries used... also the Regen brakes would help considerably as the run is downhill)? 3) How much weight was in the trailers? 4) Who makes the trailers themselves? I've never gotten an answer on that and it could be of signicant consequence. For instance, the trailers could have regen and controlled brakes, plus solar panels on the roof. I can not imagine no one seeing them on a 260mi trip. Ideal for Hyperloop style transport. May not even need energy on balance to send skates uphill and take cargo down.